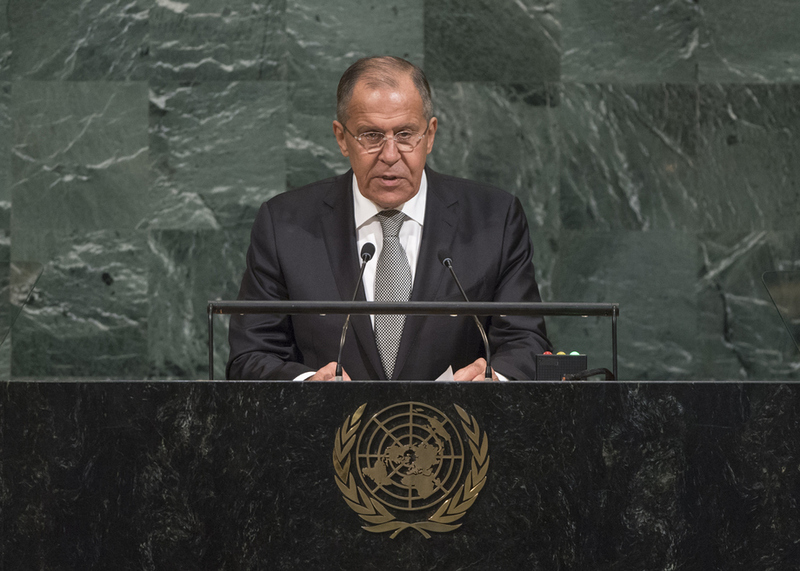 SERGEY V. LAVROV, Minister for Foreign Affairs of the Russian Federation, recalled a 2016 resolution stating that it was unacceptable to interfere in States’ internal affairs and rejecting the extraterritorial use of national laws. Yet, some States, which were in the minority, were trying to dominate, guided by the logic of unipolarity. Expressing support for parts of the speech delivered by the President of the United States this week — in which he had underscored the importance of respecting sovereignty — he said he agreed that countries with different cultures could not only coexist, but work together. The Russian Federation had always abided by the principles of sovereignty, mutual respect and the equality of peoples, he said, noting that some Western States — including those in the North Atlantic Treaty Organization (NATO) — were trying restore the climate of the cold war. That group had expanded its presence in the East, provoked instability in the post-Soviet area and created anti-Russian sentiment, he said, describing those actions as the roots of the conflict in eastern Ukraine. Even under those conditions, he said the Russian Federation sought to implement the Minsk Agreements and work constructively. Among other things, it had drafted a resolution calling for a United Nations mission to protect observers to the Minsk Agreements. Warning nations not to allow the freedom of expression to be used as a pretext for glorifying fascists or permitting neo‑Nazi activities, he called for the establishment of a barrier against terrorists and extremists. In addition, “civilized Europe” was allowing monuments to past heroes to be removed and languages to be suppressed. Today, the arsenal of many Western States was not but “rough pressure”, he said. The United States was imposing new restrictions against Iran which were extraterritorial in nature and threatened the Joint Comprehensive Plan of Action. Condemning the recent nuclear activities of the Democratic People’s Republic of Korea, he nevertheless cautioned against “military hysteria”, which could lead to disaster. There was no alternative to a diplomatic solution, he said, calling on States to support the road map proposed by the Russian Federation and China. It was also unacceptable to interfere in the domestic affairs of Venezuela, as attempts to use ultimatums outside of the United Nations Charter had never led to good. Indeed, many of today’s challenges had resulted from attempts to remove regimes, and had ultimately opened space for terrorism. In that regard, he underscored the need to fight not only ISIL/Da’esh but also Al-Nusra, which, for some reason, was being spared by the international community. Recalling the outcome of the recent Astana summit on de-escalation zones in Syria, he called on all parties to commit to dialogue with a view to eliminating the terrorist hotbed and restoring Syria’s unity and territorial integrity. All uses of chemical weapons must be investigated honestly and impartially without the manipulation of the Organization for the Prohibition of Chemical Weapons (OPCW), he said, adding that the Russian Federation had maintained its balanced approach to all conflicts in the Middle East and elsewhere. In that vein, he emphasized the need to restore Palestinian unity, pledging that the Russian Federation would continue to cooperate with the parties including through the Middle East Quartet. More broadly, he warned that it was an illusion to try to create “separate islands of security”. The main responsibility for security, including in the fight against terrorism, was borne by States, as provided for in the United Nations Global Counter-Terrorism Strategy. The Russian Federation was committed to working towards the goal of a world free of nuclear weapons under the existing Non-Proliferation Treaty regime, but that process must take into account the realities of the world and allow for national security. Cyberspace must not become another forum for conflict between States or spreading terrorist ideology, he said, noting that his country had prepared a draft of a convention for counteracting cybercrimes, including hacking. Calling on all nations to adapt to global changes through a collaborative approach, he said they must also ensure that the world order was both just and democratic, and took into account the interest of all States without exception. Speaking in exercise of the right of reply, the representative of Ukraine responded to Russian Federation.